AirClean Energy, Inc & Practical Steam, Inc.
Visit Booth #2473 to increase your business's profitability! 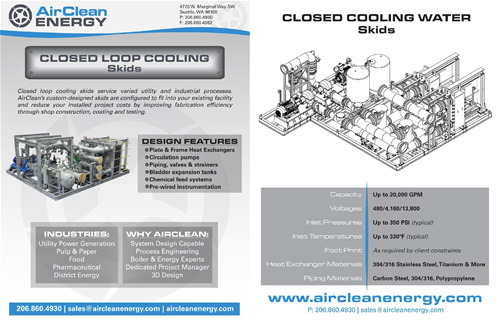 AirClean Energy specifies, engineers and manufactures our own line of skid-mounted, steam-driven generators, integrating them with boilers, HRSG's and waste-heat-recovery solutions to increase your business's profitability. 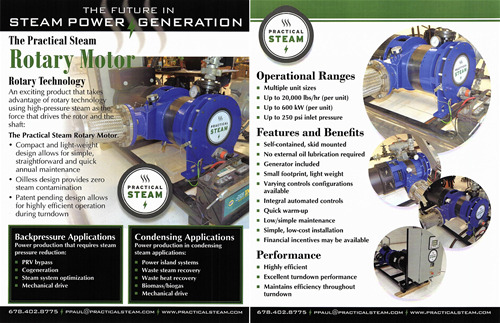 Practical Steam manufactures steam motor genset packages for power generation / reclamation under 20,000 lbs/hr. 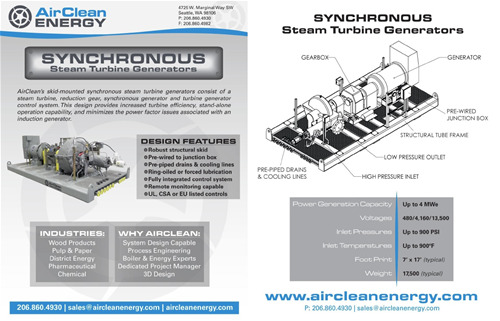 Synchronous Steam Turbine Generators and More! AirClean's skid-mounted, and field erected, synchronous steam turbine generators are ideal for industrial facilities looking to reduce or eliminate their dependence on the grid. Each synchronous system consists of a steam turbine, reduction gear, generator and stand-alone control package. These packages can be skid mounted up to 7 MWe, depending on the turbine OEM selected. The Practical Steam Motor is a self-contained, skid-mounted, steam-powered motor genset unit, that is oilless, easy to install, and maintain. Up to 20,000 lbs/hr (per unit). Up to 600 kW (per unit). Up to 250 psig inlet pressure. Excellent turndown performance, maintaining efficiency throughout turndown. Varying controls configurations available. Integrated automated controls.